As you can see, I have incorporated Google Adsense into my site. According to Google..
Certain locations tend to be more successful than others. 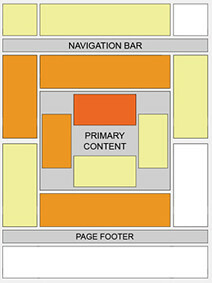 This "heat map" illustrates these ideal placements on a sample page layout. The colors fade from dark orange (strongest performance) to light yellow (weakest performance). Based on this advise, I have inserted AdSense for the first two blog entries in the list. The following blog entry describes the process of placing AdSense ads between blog posts.